It’s easy to get a tennis outfit’s design wrong (read: not cute). A general rule of thumb to keep the design right (read: cute) is to go with a white top, white skirt or shorts, and some manner of (minimal) matching color stripping on the shirt and shorts/skirt. Add in white socks and white shoes with a color-matching stripe, and the outfit is a success (read: very cute). There are other right (read: cute) ways to design a tennis outfit, but you can’t go wrong if you stick to these basics. 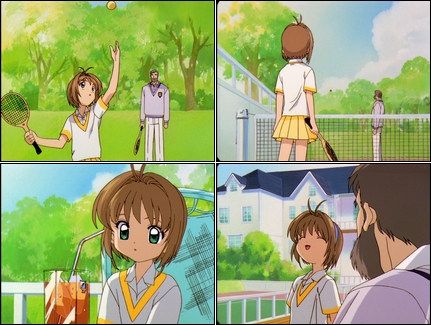 In episode 16 of Cardcaptor Sakura, “Sakura and the Rainbow of Memories”, Sakura plays a game of tennis with a kindly man she meets while on summer vacation. The outfit she wears meets many the above guidelines, and it even takes it a step further by matching the color of the socks to the skirt. One downside to this outfit is the decision to use a pleated skirt, rather than a common tennis skirt or skort design. Another complaint about this outfit is the use of a non-pastel yellow on the shirt. This would work if the pleated skirt were also not pastel, but the two yellows appear to clash more than work together. 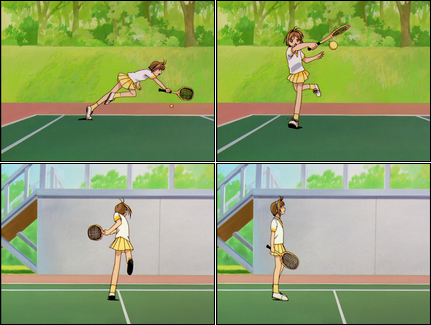 Another tennis outfit appearance is in Strawberry Marshmallow, episode four, “Part-Time Job“. Miu daydreams what kind of part-time job Ana would be suited for, and determines ball retriever on a tennis court to be suitable. I’m not a fan of the sleeveless look on a shirt like this. Ana’s outfit mostly sticks to white, using a thin, pastel pink line in the skirt, with matching pink tennis shoes. The overall style is very simple, and equally plain. If there were better views of the outfit, the style would have appealed to me more. 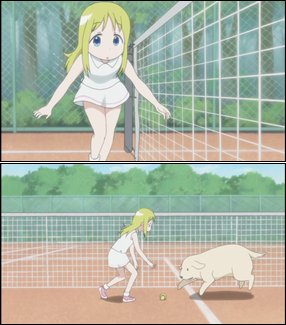 It may be plain due to Ana’s role as a ball retriever, and not a tennis player. 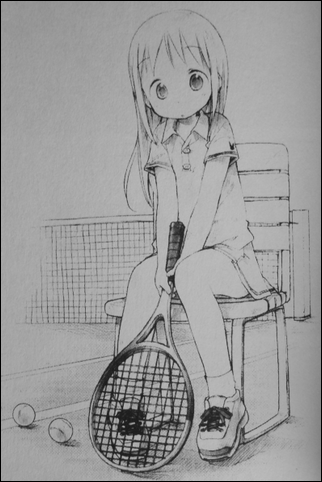 An artwork in the Strawberry Marshmallow manga depicts Ana in a tennis outfit, featuring an improved design compared with in the anime. In this outfit, Ana’s shirt includes sleeves, as well as two buttons at the collar, both of these pluses versus the anime design. The ends of the sleeves of the shirt and the skirt feature strips of color as well. The shoes may be white or a solid color, with a stripe of (darker) color on the front, and white on top.